PTOLEMY -Text page with coordinate net showing meridians and parallels and large initial. PTOLEMY,C./ FRIES,L. - Text page with coordinate net showing meridians and parallels and large initial. Text page with coordinate net showing meridians and parallels and large initial. - PTOLEMY,C./ FRIES,L. Title : Text page with coordinate net showing meridians and parallels and large initial..
Map maker : PTOLEMY,C./ FRIES,L.. Size : 14.8 x 10.6 inches. / 37.5 x 27.0 cm. 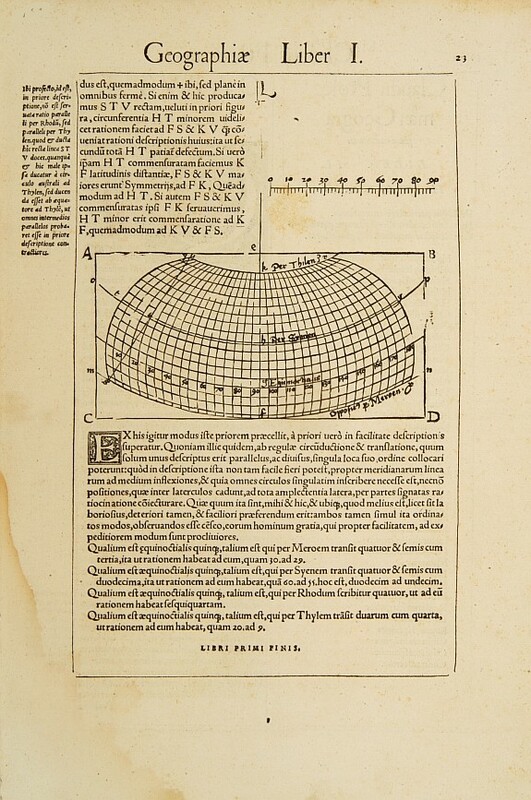 Description :Text leaf from the Strasburg edition of Ptolemy's atlas edited by Laurent Fries. On recto and verso an introduction with on recto coordinate net showing meridians and parallels. VERSO: 11 line intial Q in metal cut. Condition : Paper very slightly age-toned. Generally very good for such an early piece.